Despite rapid scientific progress, firm knowledge about the societal consequences of global warming remains limited. What are the implications of climate change for peace and security? Should we expect more wars and more political instability as the world heats up? The real concerns linked to climate change are not about shrinking glaciers, eroding coastlines, or changes in precipitation patterns. Nor, strictly speaking, are they about coral bleaching, phenological changes, or species migration. The primary grounds for concern relate to the consequences these physical changes will have for societal development and prosperity, including human well-being and physical security. It is somewhat discomforting, then, that there is considerably deeper scientific understanding of the impacts humans have on the climate system than of the effects of climate change on human activity. There is an obvious and articulated need for more systematic research into the societal consequences of global warming. In response to this need, PRIO has initiated a number of new research projects in recent years targeted specifically at the security implications of climate change. This article discusses some of these implications. At the same time, this is a young and rapidly growing field of research. Until now, most published studies have tested only direct effects and have taken little account of variations in societies’ sensitivity to meteorological conditions. 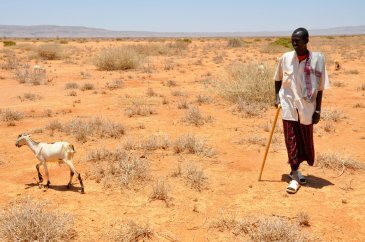 However, it seems unlikely that a given climatic shock, such as growing season drought, should have the same effect on communities across different ecological zones and socio-economic contexts, but this is an implicit assumption in many of the studies. A new wave of more nuanced and plausible studies is now emerging. Some of these depart from testing the effects of climate change directly and instead consider indirect and conditional relationships, for example via adverse weather impacts on agricultural production or food prices. Indeed, in the case of food-price shocks, we are beginning to see the contours of a systematic association with urban uprisings. Several studies suggest that rising food-prices contributed to triggering the initial waves of protest during the Arab Spring of 2011, and although the protests primarily evolved around political issues, high bread prices facilitated the mobilization of the masses. So, what about income shocks caused by harvest loss? We know that poverty and weak economic development are key causes of many armed conflicts, and in developing countries farming and livestock husbandry are the largest modes of livelihood and significant sources of both government and household revenue. In 2015, we published a study that investigated the extent to which weather-induced variations in agricultural production explained outbreaks of political violence in Africa. As one would expect, harvest volumes were found to correlate strongly with levels of precipitation, especially in areas with steppe climates, such as the Sahel, where lack of rain results in significantly lower yields. However, our analysis lent little support to the hypothesis that a severe drop in agricultural income, in turn, increases the risk of conflict – not even in models that allowed the shock effect to vary with political and economic conditions. While drought and failing harvests thus seem to have a limited role in explaining outbreaks of conflict, there is more to suggest that weather patterns may affect dynamics of violence in areas of chronic instability, although the findings are not always consistent here either. For example, we see that levels of inter-group violence in Kenya drop in periods when resources are increasingly scarce, which is the opposite of what the traditional scarcity thesis suggests. At the same time, we have found that conflicts in rural India tend to escalate when income from farming falls. How can we explain these contradictory findings? Partly they may be due to systematic differences in cultural, socio-economic, and institutional conditions between the Kenyan and Indian countryside that affect the vulnerability to rapid environmental changes. Some of the differences in findings may also be because communal conflicts, such as those we find in Kenya, follow a different logic than conventional rebel-government fighting. In a new study published in PNAS last fall, we conducted an actor-oriented analysis of the correlation between local drought and conflict involvement among rural groups in Asia and Africa since 1989. Drawing on high-resolution meteorological, ecological, and demographic data, we were able to measure drought severity specifically for the growing season for the dominant crop in each group’s agricultural areas, which we linked to georeferenced conflict event and actor data. Moreover, we allowed the estimated effect of drought on conflict to vary as a function of local agricultural activity as well as economic and ethno-political marginalization (Figure 1). A comprehensive set of statistical models indicated a weak and inconsistent effect of drought on the risk of a new conflict outbreak. 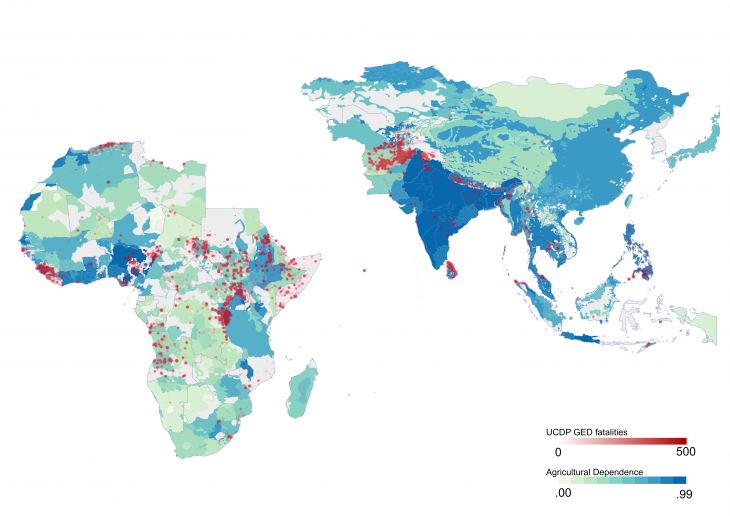 However, and in line with the results from India, we found that drought is associated with an increased likelihood of prolonged violence, especially for politically excluded groups in the least developed countries. This finding is indicative of a reciprocal relationship; while drought may facilitate sustained resistance, violent conflict makes the local population more vulnerable to environmental changes, implying a vicious circle of economic marginalization and political instability. Although conflict research thus far has uncovered mostly weak and partially contradictory effects of climate variability on conflict, we are still far from being able to conclude about the relationship between nature and security. First, this is still an under-researched field with clear limitations, but also promising opportunities for future research. Second, we have only just begun to observe the physical effects of human-induced warming. Although most states and societies have managed to adapt to recent environmental changes, there is no guarantee that this will continue. Moreover, future climate changes are expected to have measurable impacts on economic activity well beyond the agricultural sector, as well as on settlement patterns and migration in many parts of the world, and thereby accentuate the effects of existing population growth and urbanization. These processes may have significant social and political consequences that societies hitherto have not experienced. Given some assumptions, it is nonetheless possible to envisage how things may turn out in the future. In the first study of its kind, we simulated the incidence of civil war until the year 2100 along a set of shared socio-economic pathways (SSPs), which have been developed as a supplement to traditional climate change scenarios. There are three quantified aspects of development in these five scenarios that are of particular relevance to armed conflict risk: population growth; economic growth (GDP); and growth in human capital (education). The simulations revealed that SSP1 (‘sustainability’) and SSP5 (‘conventional development’) are associated with the lowest frequencies of conflict, since both are based on high growth in education and GDP and moderate population growth. The two pathways differ in that SSP1 assumes a high level of investment in renewable energy and technology and more sustainable food consumption, which is consistent with a low-emissions scenario. The most pessimistic socio-economic scenarios suggest a fragmented (SSP3) and unequal (SSP4) world with clear limitations on economic and social development, especially for the least developed countries with medium to high population growth. Figure 2 shows the simulated results for the world as a whole and for various geographical regions. According to these models, the incidence of conflicts will remain low in Europe and North America, while there are major differences in conflict density between the scenarios for other regions. To be clear, these simulations are not intended to be actual predictions in the way that weather forecasts and early warning models are, but rather a tool for analyzing and visualizing implications for peace and security of a range of assumptions about climate change and societal development. Figure 2. 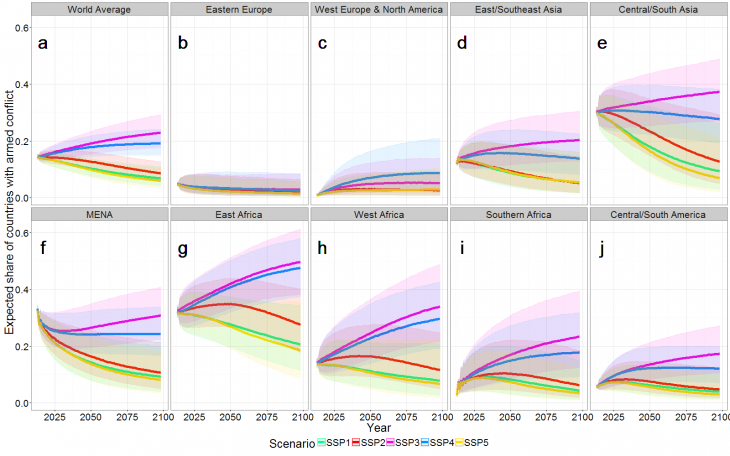 End-of-century projections of conflict along five alternative socio-economic scenarios. See Hegre et al. for details. There is little reason to expect that wilder, wetter, drier and warmer weather or rising sea levels by themselves will become the most significant causes of conflict in the foreseeable future. So, will climate change lead to more wars in the future? It is, of course, impossible to give a precise answer to this question. But based on what we know today, there is little reason to expect that wilder, wetter, drier and warmer weather or rising sea levels by themselves will become the most significant causes of conflict in the foreseeable future. Armed conflicts are more than anything else a symptom of political failure, both in terms of creating or allowing social conditions that provide fertile ground for widespread suffering and grievances (such as extreme poverty, inequality, oppression or corruption) and in terms of contributing to, or failing to prevent, social conflicts and protests escalating to the use of military violence. Although some have claimed that the severe drought in northern Syria and the resultant migration to cities in the years leading up to the protests in 2011 were significant causes of the civil war, there is no deterministic connection between drought, loss of livelihood, misery, and unrest. 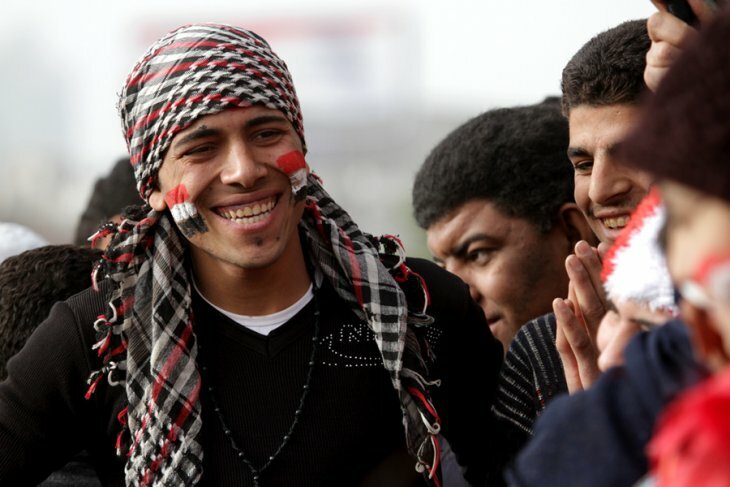 Fifty years of misgovernment, economic stagnation, and arbitrary exercise of government authority formed the basis for the Syrian popular uprising, and the preceding upheavals in Tunisia and Egypt led the Syrian opposition to believe that the same could be achieved in Syria. Was the drought a sufficient precondition for rebellion? Not at all. Was it a necessary ingredient in the cocktail of factors that motivated and enabled the first wave of protests? Probably not. On the other hand, Syria most likely would have avoided its current tragic situation if the al-Assad regime had responded to the initial demonstrations in a restrained and responsible manner. As the IPCC’s Fifth Assessment Report makes clear, climate change will contribute to intensifying existing challenges for vulnerable communities by inhibiting agricultural productivity, reducing access to freshwater, making heatwaves more intolerable, and threatening physical infrastructure. These trends imply relative, not absolute, impacts on societal development in the sense that other factors are held constant. In other words, things will get worse in the absence of countermeasures, innovation, and substitution. However, history has shown that it makes little sense to assume status quo when considering societal changes over a half century or longer. For example, despite a marked and worrying increase in the frequency of extreme weather events and simultaneous population growth in recent decades, there is no contemporaneous increase in the number of deaths caused by these natural disasters. The reason is obvious: societies have become more able to cope with extreme weather events through better preparedness and improved response. While the impact of climatic events on violence and instability is modest, the significance of the reverse relationship should not be underestimated: Violent conflicts and wars are among the most important drivers of environmental vulnerability. Accordingly, an important challenge for future research will be to try to understand how extreme weather and environmental changes interact with policy formation, and to discover what institutional and socio-economic conditions are best suited to minimize challenges related to human-induced climate change. Likewise, it is useful to remind ourselves that the modal response to negative environmental changes blends cooperation, innovation, and peaceful conflict management – not violence and instability. This is another topic with great potential for more research that could help facilitate transfer of insights and experience about ‘what works’ to societies that traditionally have struggled to achieve efficient and peaceful management of resource competition and environmental stress.